I did try shakes a few years back, but I just couldn’t get past the chalky taste that most protein powders have. I’ve found a few now that blend really well. No chalk, just goodness. I’m always on the fence about listing brands because a: I’m not getting paid to promote them and b: because everyone is different, so what works for me or I like doesn’t mean it will for you, so I’m just going to put them out there and let you decide for yourself. For me, I hated going through several brands to find these winners, so hopefully this will save a few steps for you. Start off with a good blender. There are so many great ones out there. If you don’t have a good one, go for it. Invest in one. I invested in the Nutri-Bullet and held my breath. Usually these gimmicky things turn out to be crap, but it really works and considering I’ve used it daily for 2 months and will for months and months to come I think $75 was worth it. What I like best about it? It mega blends everything so the results are absolute smooth smoothy. With my old blender the powders would stick to the sides or the frozen fruit would still be in little chunks. When it comes to protein powder there are a couple at my local market that work well, but a bit sweet. This one I like because it’s from plant protein and I’m pretty sure (I know) I don’t ingest enough vegetables. Amazon sells it as well as many of the healthier shops like Sprouts, PCC and the like. Get the unflavored. I’ve never tried their many flavors, but I prefer getting my flavor from the real deal. These come with a scoop in the jar. I drop a full scoop in. Beyond protein there are some ingredients that I thought were key if I was going to get my badly battered digestive tract back in working order. Chemo is really hard on the digestive tract and strips it of alot of good bacteria. Pro-biotics help to rebuild that, but L-glutamine also helps to repair the damage to the lining of your stomach. I’ve tried a few, but I could actually feel the results within just a few days of adding Jarrow’s L-glutamine powder to the mix. I put a full/rounded tablespoon in. When you first see it, it looks like fluffy chalk, but I swear you won’t taste it in the shake. “Just Cranberry” is a brand I know, but there are several. Trader Joes carries it as well as Walmart and probably most supermarkets. Usually in the unrefrigerated juice isle. Seeing it next to all the overly sweetened juices made me nervous, but I’ve grown to think of it as a diamond in the coal mine. Once you’ve opened it, keep it in the fridge. There’s a lot of talk about how bad plastic bottles are. I haven’t been in it long enough to form an educated opinion, but if you want to go with the best case scenario of what’s good for you then get your mineral/sparkling water from a can or bottle. Exploring Italy made me a fan of Pellegrino for life. Others swear by Perrier. Whatever makes YOU happy :-). When it comes to allspice, it’s all good for you, but I once had some Jamaican Allspice that made me realize that there’s allspice and then there’s fills your nostrils with the magic scent of the tropics Allspice. Hey, I’m a foodie which means I want the best taste/smell/experience for my money, so Jamaican man it is. 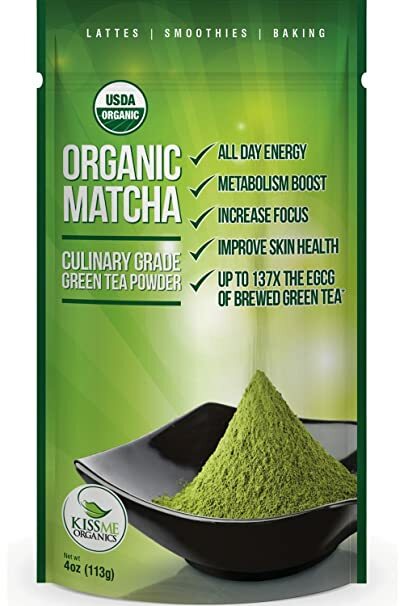 For Matcha, I either buy it off Amazon or at my local organic market. Organic is best and notice the color. A nice, rich tea-green. I’ve tried this brand of Organic Matcha. It was great. A little pricier than the one I get at my local “Sprouts” market. $25 for this 4 oz. bag, but nice. Blend it all together and drink every morning before tea or coffee. This combo of antioxidants and probiotics will help boost your immune systems, detox the chemical and re-balance your digestive tract.